October 2014 - A.I.R. Plus Inc.
Do the flames on my gas furnace look normal? 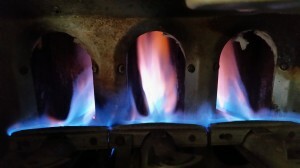 The attached pictures are of a 30+-year old gas furnace with stamped-steel slotted burners. It appears the burners themselves have never been removed to be cleaned and therefore the orange colored flames are a by product of dirt and dust particles and possiblly incomplete combustion of the natural gas fuel. A proper flame color should be, dark blue at the bottom, light blue in the middle with a slight orange tip at the top. Yellow tips indicate an air starved flame emitting poisnous carbon monoxide and the gas furnace should be serviced immediately! Verifying the gas pressure and cleaning the burners, along with a carbon monoxide test, are necessary on older gas furnaces to insure you have a safe envoirment for your family. A 26-point furnace check-up which includes the testing of the gas pressures and the carbon monoxide test should be perfromed every fall season. Oklahoma Natural Gas Co provides a $30 rebate for their cusotmers who have this service performed by a qualified contractor. Give A.I.R. a call today at 405-618-2247 to have your furnace safe and ready for the winter season. And take advantage of the rebate offer by allowing us to prepare the rebate form for you! A.I.R. services Choctaw, Harrah, Midwest City, Mcloud, Luther, Jones, Newalla and all of Eastern Oklahoma County.